Would you blow £35,000 on a luxury version of a Ford Ka? Back in the Sixties someone did the equivalent and others followed. There’s a partial myth about British class barriers finally breaking down in the 1960s. Yes, this was a time when working class kids like David Bailey could make it without having to go to elocution classes and when satire suddenly made the establishment seem less intimidating. But beneath the veneer, and outside the world of ‘creativity’, for most it was business as usual. 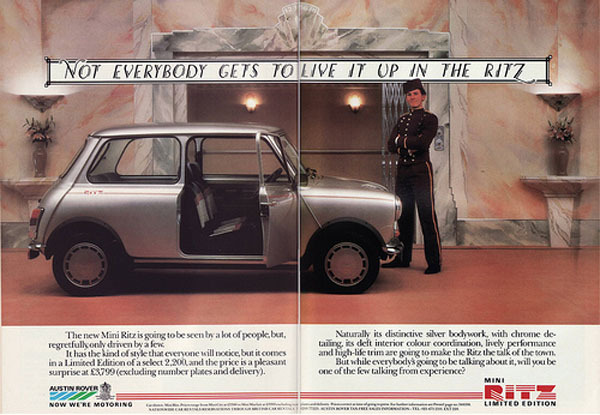 The Mini is presented as a classless vehicle. Because it was so different, you didn’t need to apologise for it. You bought it for what it was, not because it was all you could afford. But, for some, that wasn’t enough. There are entire books covering the huge range of cars spun off from the Mini platform but, of these, the ones that more or less kept the appearance of the original interested me most. 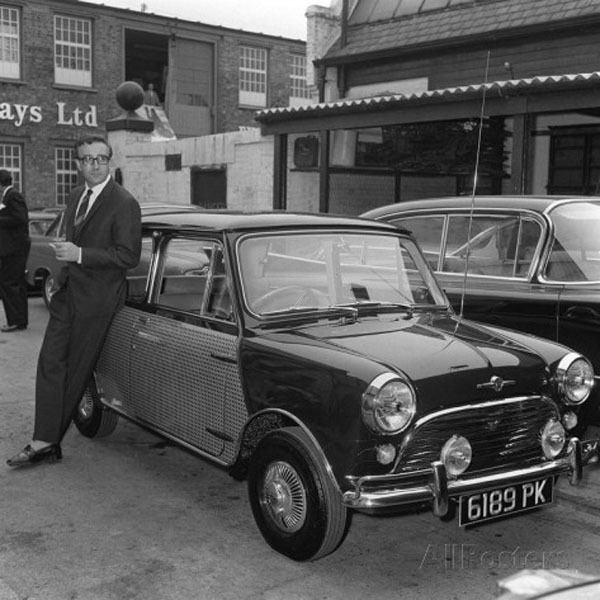 In 1962 the actor Peter Sellers commissioned a special Mini to be built for him. The work is ascribed to coachbuilders Hooper, whose roots stretched back to the early 19th Century, but it’s a bit hard to know what their set-up was by then. After the fiasco of the Docker Daimlers, by the 1960s Hooper had become more of a service company than coachbuilders. 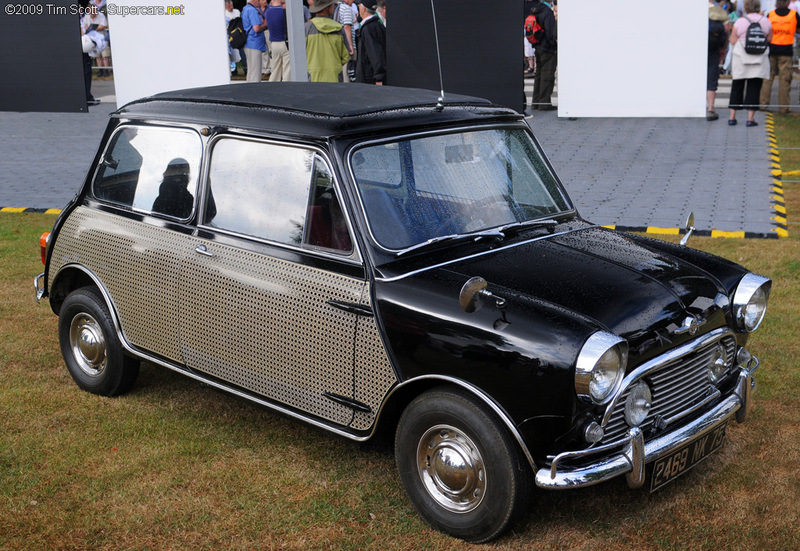 Based on a Cooper, the car was fitted with Reutter seats, trimmed inside with Connolly leather and had a wooden dashboard, full instruments and electric windows. Outside it was finished in a dark purple, and a final clever touch were the ‘wickerwork’ sides, real wickerwork cut down to a veneer, lacquered and applied over the paintwork. These were a long-established part of the coachbuilder’s repertoire but, applied to the side of the tiny Morris they had a certain wit, particularly by making use of the Mini’s wing seam as a border. The cost of the car to Sellers was nearly four times that of an ordinary Cooper. After this, a second, similar car, but left hand drive, was commissioned from Harold Radford & Co for the Peter Sellers film ‘Shot In The Dark’. Certainly, post War, the traditional coachbuilders were having a hard time. Unitary construction meant that rebodying was no easy thing. They were looking around for suitable projects, such as estate car conversions, so the idea of employing their skills to produce an affordable ‘luxury’ car would have appealed. In 1963, Radfords introduced the Mini De Ville, in three versions, which aimed to offer a Bentley like ambience. Depending on the model, you got all or some of the following – sunroof, recessed foglamps, cowled headlamps, timber dash, cigar lighter, additional instruments, reversing light, badge bar, whitewall tyres, two-tone paint with coachline, full door cards, armrests, leather trim, maplights, lambs wool carpets, electric windows, dipping mirror, air horns, electric window washers, reclining seats and Sellers-like wickerwork sides. Much of this sounds pretty ordinary, but back then you found few of these touches in an everyday car. Some later Radford Minis were further distinguished from the mass by incorporating stacked headlamp units, as used by Facel Vega, which fitted rather well, and Radford even did some hatchback conversions. Another company, Wood & Pickett, formed by two ex Hooper employees in the late 1940s produced another luxury Mini, the Margrave, which also later used the stacked headlamp trick, this time with the vertical units off the new Mercedes 200. For those who wanted something more sporty, there was the Minisprint. Poor old Issigonis laboured to provide all that space in such a small package, then Neville Trickett came along and chopped and sectioned the body by 75 mm. The seams were removed and the Stuart & Arden version took the restyling even further, incorporating square headlamps. 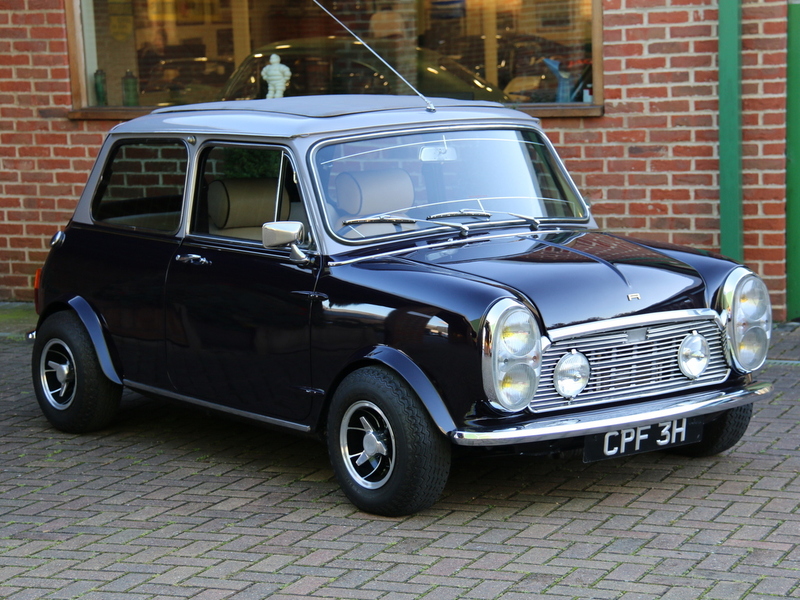 Much later, when it was the done thing for an ageing model, the production Mini was offered with special editions, but these never appealed as well as the ones produced by independent specialists in the Sixties. 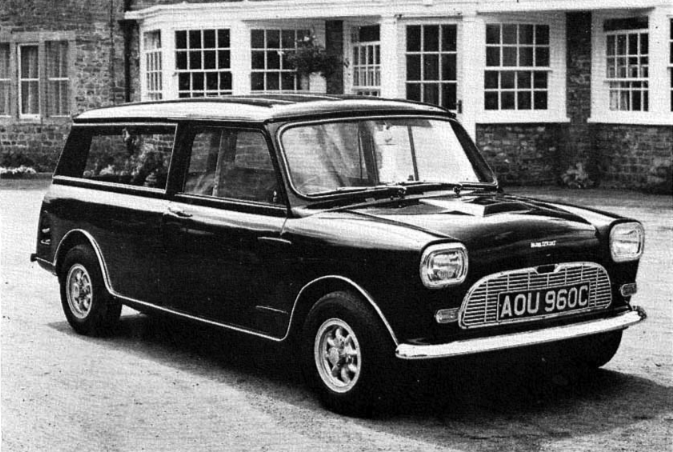 By then, the Mini was no longer the transport of choice for those who could afford something more expensive. The luxury Minis had been particularly popular with celebrities. They said that you’d made it, but they weren’t pompous. Apart from Peter Sellers, Mick Jagger and each of the Beatles had them. However, by the end of the Minis painfully long life, the fun was rather too forced. That’s a nice article! From the title, I first feared you wanted to write about the current “Mini” monstrosities. Some of the conversions here remind me of the Aston Martin Cygnet which also was several times the price of an ordinary Toyota iQ. The Cygnet is an interesting comparison, since it well contrasts different ages and attitudes. At the time there was something tongue-in-cheek about a luxury Mini. It said “ha,ha, I think I’m a Rolls, but you know I’m not really”. It was ‘fun’ (copyright Citroen) for the owners and for passers-by. There was none of that feeling with the Cygnet. Yes, tongue-in-cheek is not something you can find in today’s automotive world. I guess it’s bad for resale value as it undermines one’s reputation as a serious person. The Facel Vega headlamps look as if they were designed for the car. They really improve the whole car’s look especially with the flared arches and fat tyres. Couldn’t find a picture of one with Bracq’s delicate headlamps though. Off to dig around on google! I think it was pretty much the other way around. Seeing this is a Radford conversion, they probably redesigned the entire front wing around those headlamps. There’s thicker seam going around the entire enclosement, the front part has to be hollowed out to clear the lamp bowls, and all the other curves readjusted to fit the part. The entire wing is probably hand beaten around a wooden buck, and with invisble seams all over. That’s a lot of beating and leading and smoothing out, for something that most people would never even notice. But yeah, it’s considerations like that where all the money went. I think only a couple featured the FV headlamps – after all I don’t imagine the units themselves were cheap or plentiful. Both these comments are correct. The lamps from the considerably larger Facels do work oddly well with the Mini, suiting the curvature, unlike the Mercedes lamps of the Margraves which are a bit too square. But as Ingvar says, this wouldn’t have been an easy job, though I expect preparatory ‘design’ work would have been restricted to taking a ply template off the back of the lamp units, then just reprofiling by eye. Note they also deseamed the wing, unlike the earlier Radfords. Of course, today, the seams are seen as an essential part of the original design, reflected by the rear end of the clamshell bonnet on current MINIs. I checked out the Margrave online with the Merc’s headlamps and they don’t work nearly as well. I also saw one that sported the Merc’s grille and it really wasn’t a pretty sight! Agree the Facel Vega headlights looks good on the Radford Mini, there was also the Bertone Cooper which John Cooper had commissioned Bertone that to my mind had potential (even though am not a fan of the Elf/Hornet style grille). Could BMC have found a way to make a profit off of such luxury Mini conversions done by Radford, Wood & Pickett and Hooper? Perhaps consolidated under Vanden Plas? Bob. I suspect not. They seem to be one of those things whose appeal was that they weren’t official. That made them quirky. If they’d been made by the works, everyone would have though they were a bit pretentious. Like Vanden Plas! There was a trend during the 1970’s to put Mercedes and Rolls Royce grilles on modified Minis, which depending on your viewpoint was either an ironic statement about snobbery or the sort of failed seriousness that characterised the Vanden Plas Allegro. There were also some truly awful contrivances based on the Clubman, I recall. Nevertheless, I’ve always admired the Radford and Wood & Picket Coopers & would still quite fancy one. Unsurprisingly, dear Alec detested them – particularly the comfortable seats, decent driving position and horresco referens, wind-down windows. 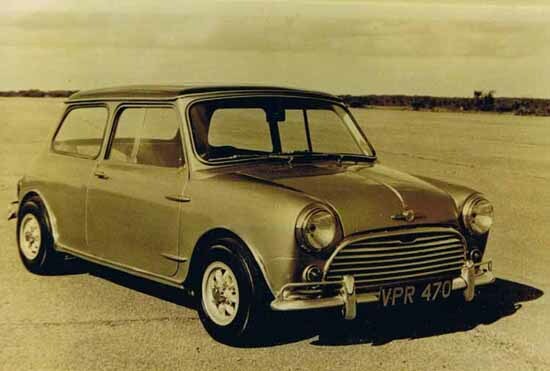 Though unsure how realistic it is, was thinking of a Vanden Plas Mini that allows a much greater degree of customization depending on the price such as a unique range of front ends along with other personalized exterior and interior modifications, etc. Especially if the Wolseley and Riley marques (along with their slow selling Mini-based Wolseley Hornet / Riley Elf variants) are killed off in the late-1950s prior to the launch of the Mini. Has anyone ever done the reverse: take a Rolls and strip it down to the bare minimum. Imagine a Rolls Royce Silver Shadow with Cortina L fitments? I understand a few self-made millionaires prefer their RR Ghost in the guise of a BMW 7 series, if that’s what you mean? Essentially the same vehicle, but comprehensively reworked to resemble a more humdrum German executive saloon and draw little attention from other road users. Some even fit diesel engines to reduce running costs! Ingenious of BMW to buy their bodyshells off Rolls Royce in order to keep development costs down. I believe that VW do something similar, using a cut-down Continental platform for the Golf. Bob: the V de P version you envision could be done with today’s Mini. I hear there is a four-door due. Imagine it with Rolls-Royce standard Connolly leather, an imposing grille and lavish refinements: a Brougham-class Mini. and they did the “inspired by Goodwood” version in the previous-gen Mini, some 5 years ago. That Mini-Royce wasn’t unappealing to my eyes, I must admit. The idea of having a compact, inconspicuous inner-city roundabout equipped with proper wood and a scent of (Bridge of Weir?) hide does have its merits. Certainly much more so than the after-effects of a head-on collision involving an Aston Martin and a Smart.